Treatment via "filtering mass" is a form of biological treatment of wastewater by bacteria for which the biotope is sand. This technology can be used for the purification of wastewater in terms of an inexpensive secondary treatment at the outlet of a conventional treatment plant before discharge into the environment as well as on a community scale of a village or a section of town or even a family. 2) Who use or recommends this means ? 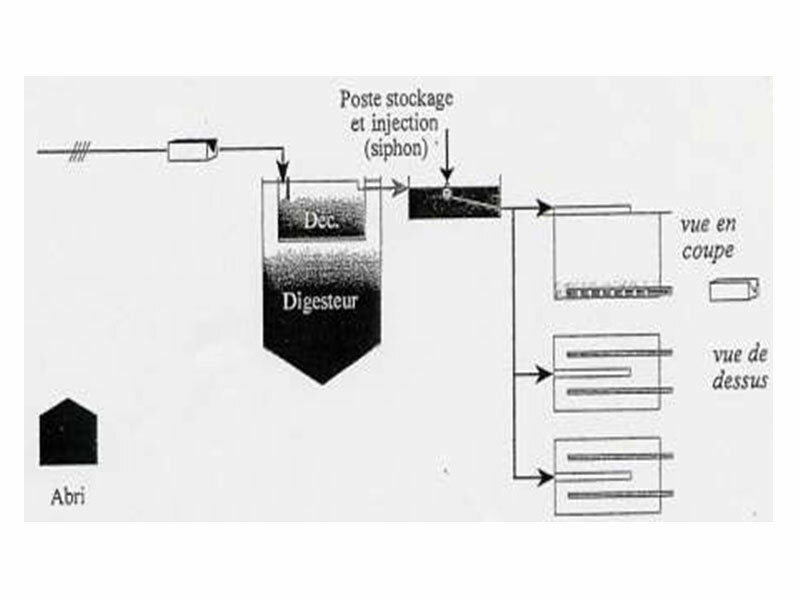 In France, this secondary treatment method for wastewater is used in several towns and is validated by the public authorities. This treatment technology is an interesting solution in particular when the geographical context complicates the discharge of wastewater into the environment. 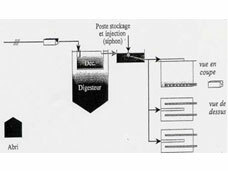 Its cost in terms of energy is very low and the cost to maintain it is much less than that of plants operating with activated sludge. This treatment method is especially indicated in certain geographical contexts such as zones without an outlet, coastal fringe and alluvial plains. In the first case, the limestone subsoils in certain zones prevent the towns that do not have a permanent stream to discharge the wastewater. Yet water treated par infiltration-percolation makes it possible to preserve the quality of the groundwater reserves. With regards to the coastal fringe, wastewater is received by the water table of the dune area, as the sand from the dunes is a favourable medium for purification. For alluvial plains, this treatment par infiltration makes it possible to avoid discharging wastewater after treatment into bathing water. 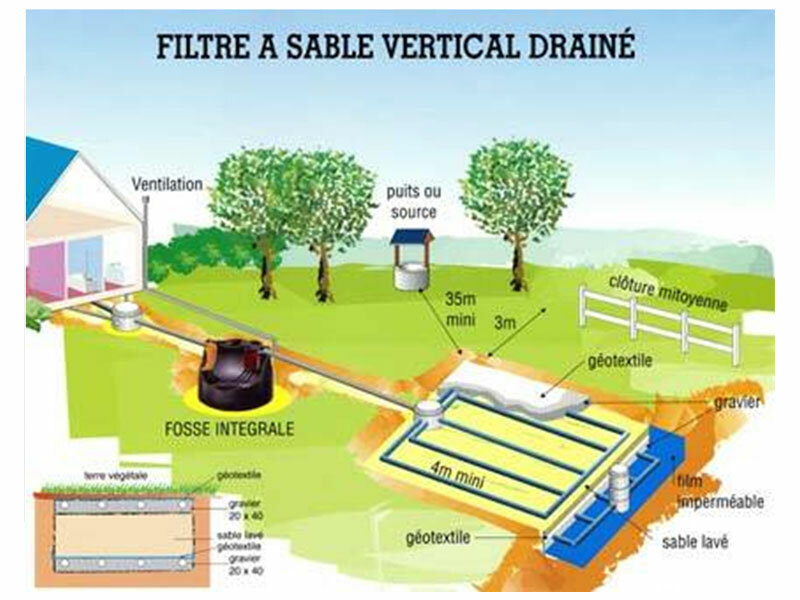 This method can make it possible to finish treating wastewater in communities of communes or communes ranging up to 2000 inhabitant equivalents. This treatment is organised into 3 surface masses making it possible to accommodate 0.5m2 per inhabitant equivalent in order to be able to alternate diverse phases. - Elimination of suspended matter : this is carried out thanks to the primary treatment from which water is coming (most often via decantation) and via physical filtering when passing through the mass of sand. A surface layer of sludge is formed on the filtering mass which is degraded during the drying phases. The drying phases are alternated with operation phases for each mass (of an average duration between 3 days and one week). - Oxidation of organic and nitrogenous matter : this function is provided by aerobic bacteria that have as a substrate the sand of the mass. These bacteria oxidise the organic matter into mineral matter. It is important that the mass contain enough oxygen so that the bacteria can correctly fulfil their function. As such, care must be taken to not submerge the masses in water too long (which is why an alternation between several masses is indispensable). 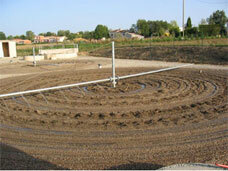 In addition, the wastewater must be properly distributed over the beds of masses. This is accomplished via a rhythmic supply which also makes it possible to stimulate the re-oxygenation of the mass. Indeed, the air is sucked at the same time as the water infiltrates into the mass. - Disinfection : in order to eliminate the microorganisms present in wastewater, the combination of the properties of the mass is important. Mechanical filtering via sand, microbial degradation via bacteria allow for this. The thicker the filter is, the higher the quality of the resulting water. Removal of the water filtered as such is then done either through percolation towards the water table, or via drainage towards a stream. The principle is identical. The pre-treatment and the primary treatment are replaced with the presence of an all-water septic tank in which a form of decantation is produced. The water is then carried to the filtering mass by rigid or flexible drains and passes through a bed of washed limestone sand. It is then purified according to the same principle as in a treatment plant thanks to bacteria. At the outlet of the filter the water is, according to the nature of the ground, either infiltrated directly, or is drained and carried to the outside environment or a well. Care must be taken to avoid contaminating the ground and for this comply with a certain number of preventive measures, in particular in terms of minimum distances of the surrounding installations. For more information on the subject, refer to the standards that are in effect in the country of the location. The figures on the diagram above provide an order of magnitude to comply with in order to prevent pollution and nuisance. The minimum surface area for the filter bed is 20 m2 (for a maximum of 4 main rooms in the dwelling). Regardless of the type of facility under consideration, special attention must be given to the geological context in which the latter is done. Easy access to the manholes must be provided at all times in order to be able to monitor the facility and maintain the latter easily and on a regular basis. 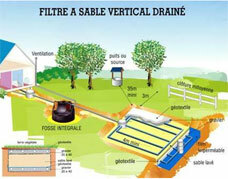 Allows for adapted solutions in particular for geological locations where sanitation is difficult. Does not support abrupt variations in flow or in the concentration of effluents. Maintenance : low technical and energy costs. The main expense item in this type of facility is that of the wages of the qualified personnel in order to ensure the maintenance.